The recent papers, by Kyle Armour (hereafter A17) and by us (Proistosescu and Huybers, 2017) (hereafter PH17), build on a large literature documenting the time-dependence of climate feedbacks in models. They make quantitative apples-to-apples comparisons between the climate sensitivities simulated by CMIP5 models and those inferred from global energy budget observations. Because feedbacks may change over time as patterns of warming evolve, observations made today do not necessarily provide estimates of the long-term, equilibrium climate sensitivity (ECS). Rather, they constrain a quantity that we call the inferred (A17), or instantaneous (PH17), climate sensitivity (ICS). The two studies were performed independently using distinct methodologies, and both find that ICS values are systematically lower than ECS values within CMIP5 models. Moreover, they find that model-derived ICS values are consistent with ICS values inferred from observations. Figure shows model Equilibrium Climate Sensitivity (ECS, blue, from PH17), compared with observationally- and model-derived Inferred/Instantaneous Climate Sensitivity (ICS, black and red). Circles denote medians, while the line denotes the 5-95% confidence interval. Solid lines indicate published estimates, dashed lines indicate PH17 and A17 values with Nic Lewis’ comments taken into account, and dot-dashed lines indicate PH17 and A17 values with both the Lewis correction and the Richardson et al (2015) correction. Nic Lewis has posted some criticisms of both papers (A17 critique, PH17 critique) where he proposes changes to these studies that supposedly render the models and data again in disagreement. The criticisms focus on the treatment of radiative forcing within the models which is used in the calculation of ICS values. We approach these criticisms by exploring their implications for the resulting ICS estimates, without necessarily implying agreement. For A17, Lewis suggests that one should (i) assume that CO2 forcing increases slightly faster than logarithmically with CO2 concentration, rather than linearly, as is traditional, and (ii) estimate model CO2 forcing values by a different method. Accounting for these two effects increases model-mean and median ICS by ~0.1°C. For PH17 the suggestions are to (i) adjust historical forcing to account for the average pre-industrial volcanic forcing, (ii) rescale the radiative forcing associated with a CO2 doubling for each model when calculating ICS, and (iii) better account for the difference between instantaneous and effective radiative forcing, a point that was raised in PH17. While the last suggested adjustment almost certainly conflates time-dependence of feedbacks with stratospheric and tropospheric adjustment, we nonetheless explore the impact of adding Lewis’ upward correction of 0.1°C. A17 employed the standard assumption that CO2 forcing increases linearly with the logarithm of concentration, while recent work suggests that CO2 forcing might increase slightly faster than linearly. Assuming this forcing nonlinearity decreases model ICS by 0.04°C, on average. A17 estimated CO2 forcing using linear regression of global radiative imbalance on global temperature over years 1-5 of each model’s abrupt CO2 quadrupling simulations. This choice was made to avoid forcing estimates being biased by the nonlinear relationship between radiative imbalance and temperature that typically emerges beyond year 5. Using years 1-20 for this calculation, as Lewis suggests, seems unwise to us. But doing so increases model ICS by 0.09°C, on average. A third suggestion was to include additional CMIP5 models in the analysis; while we do not do so here, we estimate that including them would bring model-mean ICS back to near the A17 value since most of the additional models are variants of those already included that happen to have low ICS. Temperature change is considered as an anomaly with respect to pre-industrial climate. Thus, volcanic forcing should also be considered as anomalies with respect to the average pre-industrial forcing. The issues of pre-industrial volcanic forcing can be largely avoided by considering the same averaging interval as in Lewis and Curry (2015), raising model ICS by an average of 0.1°C. Radiative forcing PH17 inferred from the CMIP5 models (which averages 3.9 W/m2) is larger for a doubling of CO2 than the estimate generally used elsewhere, including in Lewis’s estimates (3.7 W/m2, ref. AR5 TS & 9.7.1, which relies on a subset of the CMIP5 models). In order to make results comparable, PH17 rescaled radiative forcing to the commonly-used AR5 value. In the figure, we show both the original A17 and PH17 estimates of model ICS, and versions that take into account Lewis’s suggestions. The most notable change is that the PH17 model-median ICS estimate increases from 2.5 to 3.0°C, while the 5-95% credible interval narrows from 1.6 to 4.2°C to a range of 2.2 to 4.0°C. This shift is primarily in response to rescaling radiative forcing using model specific values, and it leads to better agreement between the median values of PH17 and A17. However, regardless of the methodology used, or whether or not Lewis’ suggestions are accounted for, the core results still hold: model values of ICS are consistent with observational ICS values. Should we be concerned by the remaining offset? Although consistent, the ranges of historical and model based ICS values do not completely overlap. However, there are additional effects that could be taken into account that would make the estimates more congruent. When sampled in a manner consistent with observations, by accounting for spatial coverage and differences between sea-surface and near-surface-air temperatures, changes in model temperature over the historical period are reduced by a median of 19% (i.e. Richardson et al (2015)). A proportional correction to model ICS is illustrated in the figure. Additionally, there is significant uncertainty in the magnitude and efficacy of non-CO2 forcing agents. There is enough uncertainty in fact, that accounting for the efficacy can broaden the range of observational ICS to easily contain all model estimates (Figure 1). Furthermore, while model-median ICS is based on the forced response in a model ensemble, the observational ICS depends on a single realization of Earth’s warming, the details of which are sensitive to the phase of natural variability affecting the pattern of surface warming over the periods considered. Thus, the observed estimate of ICS is almost certainly perturbed from its expected value (i.e., what would be obtained from perfect knowledge of an infinite ensemble of Earth histories). Recent evidence suggests that observed temperature patterns in recent decades, associated with a cooling of the East Pacific, can lead to a more negative cloud feedback than that seen in the historical response in models over the same period. It seems important to determine whether the inability of models to simulate these recent patterns is indicative of model deficiencies or simply a consequence of natural variability. Since both estimates have differing sources of uncertainty, demanding agreement between the best-estimate historical ICS and best-estimate model ICS would constitute over-fitting. Additionally, given the fact that the model ensemble is an ensemble of opportunity, we don’t expect the model range to cover the full uncertainty range. Still, it is worth considering the lack of model coverage in the range of low ICS. This discrepancy may reflect that while low values of ICS are allowed by observational constraints (associated with a low aerosol forcing), it is challenging to construct climate models that produce such low ICS values, as it requires a more-negative cloud feedback that is difficult to reconcile with current mechanistic understandings. Better constraints on historical aerosol forcing and forcing efficacy might go a long way towards understanding the plausibility of low ICS values (e.g. Marvel et al, 2016). An important core finding of A17 and PH17 is that values of ICS drawn from the historical record are not sufficient to constrain values of ECS. Indeed, within models, ICS and ECS differ as the strength of radiative feedbacks change over time as patterns of surface temperature evolve with warming. PH17 demonstrated that portions of the climate system that respond over centennial timescales (such as the southern oceans) are important amplifiers of climate sensitivity in the models – a slow-mode response leading to values of ECS that are higher than the values of ICS that reflect more transient warming. Increasing sensitivity over time seems to be associated with a low-cloud feedback excited by warming in the Eastern Equatorial Pacific and Southern Ocean. This slow-mode response (and thus ECS) is essentially unconstrained by global energy budget observations because warming in these regions has been small, possibly held back by upwelling water from the ocean interior. Key research targets should be improving understanding of (i) how the east-west temperature gradient in the Pacific Ocean will evolve in the future, and (ii) how low-level cloud (and other) feedbacks will respond, in turn. Zhou et al (2017) suggest that feedbacks can vary with the surface warming pattern, at least on decadal timescales. Yet, it is not known whether the magnitude by which feedbacks evolve within the models is realistic. A major challenge going forward is to develop instrumental observations capable of constraining these processes. Another potential path to better understanding slow-mode contributions to ECS is to explore paleoclimate changes occurring over timescale where the climate has had more time to fully come into equilibrium (e.g., PALAEOSENS). As usual, it will be the interplay between theoretical exploration and observational analysis that will build our understanding of climate sensitivity. Lewis’ comments have helped to sharpen consideration of the topic, but we need not make mountains of difference out of molehills. Model ICS estimates strongly overlap with observed ICS uncertainty ranges, and proposed alterations involve only small modifications. More interesting at this point is to explore how future warming could diverge from historical patterns, and how climate feedbacks in the future might be different from those at present. We thank Nic Lewis and Gavin Schmidt for comments on a draft of this post. We want to note that on the basis of as-of-yet unpublished research, Nic disagrees with our use of the Kummer and Dessler upward correction of observational ICS due to aerosol efficacy. nice blog post. very well referenced. If the sensitivity is continually changing, what use is it in predicting future climates? A well -written article on an interesting subject. I would like to make a few initial remarks. 1. For the avoidance of doubt, the fact that I commented on a draft of this article does not imply that I agree with all of what was in it apart from the point noted under acknowledgements “We want to note that on the basis of as-of-yet unpublished research, Nic disagrees with our use of the Kummer and Dessler upward correction of observational ICS due to aerosol efficacy.” That note is anyway irrelevant, since in the final version of the article the use Kummer and Dessler’s results has been abandoned, and replaced by showing in the figure the Marvel et al (2016)’s forcing-efficacy related adjustments to the Otto et al 2013 and Lewis & Curry 2015 results. 2. I pointed out here six serious problems with Marvel et al. (2016), only two of which were subsequently corrected. It s also relevant that the GISS-E2-R simulations they used were undertaken prior to correction of a serious error in its ocean model. Moreover, I believe their measure of “equilibrium efficacy” to be conceptually unsound. I do not believe that the Marvel et al. revisions to the Otto et al 2013 and Lewis & Curry 2015 results to account for efficacy (principally of greenhouse gas and land use change forcing) are justified or at all realistic. Hansen et al. (2005) found historical composite forcing to have an efficacy of almost exactly one. Moreover, as I have explained, Otto et al estimated forcing in a way that fully allowed for efficacy, so no efficacy adjustment of its results can possibly be justified. 3. The statement regarding my proposed correction to PH17 to better account for the difference between instantaneous and effective radiative forcing (ERF) that “the last suggested adjustment almost certainly conflates time-dependence of feedbacks with stratospheric and tropospheric adjustment” is confusing. My objection was that PH17’s method results in conflation of these two things, biasing radiative response estimation for their short term modes. My correction was designed to avoid such conflation and bias, by estimating ERF through regressing over a sufficiently long period (20 years) for the influence of stratospheric and tropospheric etc. adjustments (primarily on mean year one forcing) to be negligible. I understand that the quoted statement refers to possible misestimation of ERF due to feedbacks becoming affected by the long term (centennial) response mode before the end of the 20 year regression period. However, addressing the year one adjustments issue by regressing instead over years 2-10 (or even 2-5, but not over years 1-5 as in A17) produces similar results to regressing over years 1-20. 4. Time dependence of climate feedback, even if it exists in reality, would have a negligible impact on warming up to 2100. Mauritsen and Pincus (2017) estimate 0.04 K greater warming in 2100, relative to that with no time-dependency of feedbacks, using parameters corresponding to the mean time-dependency in CMIP5 models (0.12 K for the strongest dependency). This is in a stabilisation scenario; in a continuing emissions growth scenario the effect would be marginally greater in absolute terms but even smaller as a fraction of total warming. Nevertheless, the phenomenon of climate feedback strength declining with time after forcing is imposed, in most (not all) AOGCMs, is of considerable interest for understanding AOGCM behaviour. Should it be mirrored in the real world, which is far from being established, it would also be relevant for understanding and quantifying multicentennial behaviour of the actual climate system. There are various other points in the article that I take a different view on, but I have written enough for one comment! There is enough uncertainty that a little humility need apply. Yes, quite interesting. Thank you! A17 employed the standard assumption that CO2 forcing increases linearly with the logarithm of concentration, while recent work suggests that CO2 forcing might increase slightly faster than linearly. It’s a confusing moment in the text, and one that makes the difference in function seem much bigger than it really is. Ref 10 and 14 are the same paper. What is Armour’s transient, or inferred climate sensitivity? With respect to the 19% number of Richardson et al., maybe it’s an underestimate. If you compare HadCRUT4 with Berkeley Earth (Berkeley Earth corrects for sea ice bias using HadISST2), Berkeley Earth shows ~22% more warming than HadCRUT4 from 1850-2016. With respect to differences between SST and MAT trends, from 1950-2016 HadNMAT2 shows about ~17% more warming than HadSST3. Now the average height of HadNMAT2 during this period is about 20m, compared to the standard height of 2m used for global temperatures. This means that the difference in warming between SST and 2m above the surface should be only about 10% as much or 1.7%. Furthermore, not all of the Earth is ocean and Zeke Hausfather showed in a paper earlier this year that HadSST3 underestimates SST changes due to a cooling bias in ship measurements. So maybe there is an additional 1% difference in warming due to differences in SST warming and MAT warming. So empirically, it seems that the 19% number by Richardson is confirmed by evidence. Although maybe 19% is too low and 23% would be a better adjustment. I compute a 19.3% higher linear trend for BEST than HadCRUT4v5, over 1850-2016, not 22%, and 16.5% higher using changes between 30 year means at the start and end (more relevant, as the trend is non-linear). But Cowtan & Way v2, which likewise corrects for sea ice bias, warms only 8.7% more than HadCRUT (8.9% on a linear trend basis). This is a period subject to possible biases from the ~ 1940 to 1970s WW2 and technology caused switchback in SST measurement methods. Also, HadNMAT data only extends to 2010. Over the full 1880-2010 period, HadSST3 warms 10% faster than HadNMAT2 (linear trend), on my figures. And over the well-observed 1979-2010 period, HadSST3 warms over 40% faster than HadNMAT2. I think not, on both points. I’ve not heard (or read) any comments relevant to the probable damping effect of the Milankovic cycles on the Earth’s sensitivity to rising atmospheric CO2. If the past million years offers us any clues in this regard we should already have begun to slide toward another glacial period for the next 70,000 to 80,000 years. I look forward to hearing some views regarding this possibility. For the 22% number, I was lazy and just took the first and last years. So 19% would make more sense. I don’t think 16.5% would make sense to compare with Richardson et al. since they don’t use 30 year means (unless I misunderstood their methodology). Cowtan & Way v2 don’t correct for sea ice bias. They assume constant sea ice over the entire period based on the 1981-2010 mean. With respect to comparing HadSST3 and HadNMAT2, comparing long term trends between the two over such a long period (since 1880) gets unreliable, especially due to events like WW2. My understanding is that both datasets are decent after ~1956 because that’s the end of the WW2 adjustments. With respect to the 17% number for HadNMAT HadSST3 difference, you have to make sure you compare similar grid cells between the two datasets. But in any case, the difference between SST and MAT trends seems to not be that large if you take into account the fact that HadNMAT height is ~20m instead of 2m. I was refering to use of air temperatures to infill over sea ice, which is the principal bias involved. Cowtan & Way found that using median 1981-2010 sea ice concentration had a minimal effect on temperatures. And over 1990-2016, which encompasses almost all the reduction in sea ice cover, Cowtan & Way v2 warms faster than BEST. So variable sea ice coverage seems to be a non-issue. In fact, SST adjustments for the switch from bucket to engine intake measurements appear to be a marterial issue until the 1970s and even beyond. See Fig. 2.f of Kent et al 2007. Bucket measurements’ conrtribution to global mean SST was still about ~60% in 1970, falling to ~30% in 1990 and to under 10% by 2000 ( Kennedy et al 2011 Figure 2). … Notwithstanding a vicious campaign to postpone AGW mitigation. I’m the one who brought up sea ice bias in the comments… What you are referring to is more commonly referred to as coverage bias. It’s important to distinguish between the two. There is a cooling bias due to inadequate coverage in HadCRUT4, which is corrected by Cowtan & Way. However, since Cowtan & Way assumes constant instead of decreasing sea ice, there is an additional cooling bias, which is mostly corrected for by Berkeley Earth since they allow sea ice to vary. From 1990-2016, Cowtan & Way uses satellite data (if you are referring to the short C&W version), where as Berkeley Earth does not, which can allow Cowtan & Way to warm faster than Berkeley Earth. Yet from 1850-1978, when C&W long uses no satellite data, BEST warms faster than C&W, and one of the primary differences is treatment of sea ice. The difference between HadCRUT4 and C&W warming in recent decades has very little to do with HadCRUT4 having inadequate coverage per se, in particular too low coverage in high latitudes in the Acrtic. That is shown by the fact that, per ECMWF’s analysis of ERAinterim (the best regarded reanalysis) surface air temperatures over 1979-2014, warming is slightly greater if coverage is reduced to match that of HadCRUT4. As I implied, the difference between HadCRUT4 and C&W warming relates principally to the treatment of temperatures where there is sea ice. As I wrote, Cowtan & Way examined this bias and found it to be immaterial, which is consistent with the fact that Cowtan & Way v2 warms faster than BEST over 1990-2016, when the vast bulk of the decline in Arctic sea ice occurred. I referred to the long C&W version, which does not use satellite data. Where do they say this? Because I can’t see it. Which paragraph of which paper? They warm basically the same amount because coverage is really good during this period, so coverage bias is very small. The impact of sea ice bias is going to matter more when coverage is bad, i.e. before 1990, since assumptions about sea ice distribution only really matters when it comes to trying to infill unobserved regions. Also, look at the Berkeley Earth trend map. Which areas warm the fastest? The places in the North Atlantic where sea ice is lost. Ignoring sea ice changes will underestimate temperature changes in the places that are warming the fastest (where sea ice is lost). A recent paper: http://onlinelibrary.wiley.com/doi/10.1111/j.1931-0846.2016.12195.x/full deals with the arctic sea ice extent from 1850 on. In Figure 8 they show the variance of the pan arctic sea ice and for the time span 1850-1978 one can’t see any significant trend. So it seems unlikely that the faster warming of BEST has it’s origin in the sea ice treatment. @ frank – 1850-1978 clearly has significantly more sea ice than the 1981-2010 median used by Cowtan and Way. #17-21, fwiw, the paper by Walsh et al is restricted to SIE. Other comments about time period “bias” including C&W refs also appear to be restricted to extent/area as well. 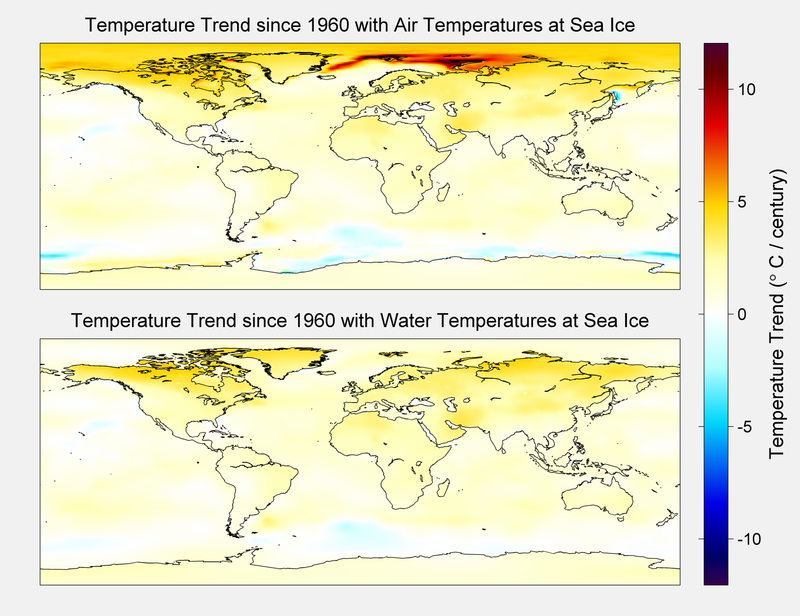 However, are you not speaking about “temperature” shifts which include the Oceans and Seas? Well my question is this: surely the Arctic PIOMASS due to extensive Multi-Year Ice volume and thickness in the period 1850 thru to the 1920s affects the temperature of the surrounding seas in a different way than SIE alone? One might also consider ‘subtle’ (?) impacts / effects of the MYI volume of the sea ice surrounding the Antarctic continent upon temperature records 1850 onwards. Yes? I suggest you look at the evidence rather than relying on the title. Over 1990-2016 the BEST version with air temperatures where there was sea-ice warmed almost as fast as Cowtan & Way v2, while HadCRUT4v5 warmed at virtually the same rate as the BEST version with water temperatures where there was sea ice. That implies that the difference in warming between HadCRUT4 and Cowtan & Way over that period is almost entirely due to differing treatment of temperatures where there is sea ice, not to coverage bias per se. “That is shown by the fact that, per ECMWF’s analysis …, warming is slightly greater if coverage is reduced. I consider Richardson et al (2016) to be a misleading paper. Certainly, if it disagrees with my claim, it is wrong. My source is an ECMWF report. The last figure shows annual 2 m air temperature anomalies for 1979 to 2014, both globally complete and with coverage reduced to match HadCRUT4 (v4, I believe). If you accurately digitise all the dark and light bars and compute the 1979-2014 trend, it is 0.158 C/decade for the globally complete 2 m air temperature. But for the coverage-reduced-to-match-HadCRUT4 version it is slightly greater at 0.159 C/decade. Moreover, the HadCRUT4v4 trend exactly matches the ERAinterim globally complete 2 m air temperature trend of 0.158 C/decade (and HadCRUT4v5 has a marginally higher trend, of 0.159 C/decade). So despite not using air temperatures over either open ocean or sea ice, and having less than global coverage, over 1979-2014 HadCRUT4 matched the warming trend of ERAinterim, which does both those things and has complete global coverage. This could mean minimal relative to the changes from HadCRUT4 and C&W, which wouldn’t exclude a sea ice bias of a few percentage points for the temperature trend. A cooling bias of a few percentage points due to sea ice bias would be consistent with Richardson et al. Interesting… I wonder if treatment of Antarctica by C&W or BEST is the reason for the discrepancy. On the other hand, if you look at the ECMWF report over the 1998-2014 period (the hiatus), the increase in coverage does appear to increase warming. So maybe 1979-2014 is just an unlucky period in terms of trend comparison, or not, idk. Scientists, like all genuine skeptics, are required to be humble before Nature. It’s necessary, though not sufficient, to not fooling themselves. Pseudo-skeptical AGW deniers, OTOH, who keep saying “it’s not happening”, “it’s not our fault”, “it won’t be bad” or “We’ll be lucky” are letting hubris fool them. That last AGW-denier meme has been labeled ‘luck-warmerism’. Luckwarmers selectively mask the upper half of the ECS PDF, while falsely accusing climate realists of masking the lower half. The luckwarmer insists that published ECS confidence limits can only mean the most cost-effective public policy is to do nothing. How about you, Dan? Are there limits to your confidence? Has anyone had a chance to read and comment on the very recent article “The application of machine learning for evaluating anthropogenic versus natural climate change” by John Abbot and Jennifer Marohasy in GeoResJ at http://www.sciencedirect.com/science/article/pii/S2214242817300426#! Seems they concluded the Equilibrium Climate Sensitivity (ECS) to be approximately 0.6 °C. that’s not a knife …. this is a knife! Where did Abbot get the idea for machine learning and crunching data? All the years he spent playing the “stock/money markets” with the retail software package he bought from the US — instead of learning about AGW/CC science. Marohasy and Abbot are ‘partners’ as in ‘married’ fellow travelers. Marohasy has long asserted devious conspiracies by the Aus.Govt, the BOM and NASA. Part of her conspiracy campaign was to assert/posit ie lie about her claims that the ANAO refused to undertake an “audit” of the BOM temperature records. A evidence for this she published a copy of HER letter of demand to the ANAO above – while never once publishing the reply she got from them. I challenged her in 2016 to publish that “written reply” from ANAO – to wit I was disappeared from her blog and other venues. She ignored my request/demand. You see I had already gone one step further by making my own formal inquiries of the ANAO to wit I got the “right response” – the same one she had received a year or so earlier — the ANAO does not do that kind of Audit – their regulatory powers rest solely on matters financial according to set laws established by the Parliament. Oh my, one could make a movie about these three stooges from down under. As always, follow the money … and connect the ‘relationship’ dots. It’s not hard to do. While trying not to give these people too much “credit” or “attention” in the process. Incompetent Narcissists crave attention folks – especially negative attention because it further entrenches their personal paranoid delusions about their own self-importance and are oppressed victims of the “system”. This Luke warmer thinks that the trend in ECS confidence limits is shrinking the fat tail. Is that what you mean by masking the upper half? However the science ends up, this Luke warmer thinks that adaptation is a more cost-effective public policy than mitigation. Do you think that today’s technology is capable of mitigating our way out of GHG forcing climate change? What exactly does “cost effective” mean in this context? I’m always hearing this sky-is-falling claim about the “economic disaster” that is supposed to result from doing things like installing solar panels or building wind farms or driving EV or reducing energy consumption, and so on. But, I never see any numbers! And, I never see any cause and effect! If you want to deal with fat tails, let’s do it on both sides of the discussion. Why should anyone give any credibility to your alarmist position, given that you don’t have any basis for it other than your opinion? Roger (@19): SO, “however the science ends up” you think that adaptation is cost effective. Interesting… that suggests that you have a preconceived notion of what you’re willing to do that is not dependent on the reality of the situation. I will freely admit that at a low enough level of ECS, adaptation is more cost effective. But surely, the higher the ECS the more relatively cost-effective mitigation becomes. What’s more, mitigation is more likely to cut off some of the tail risk than adaptation. However the science ends up, this Luke warmer thinks that adaptation is a more cost-effective public policy than mitigation. Uh…if you don’t care about the science, what makes you think adaptation is a more cost-effective public policy than mitigation? Stipulating, of course, that adaptation might be a more cost-effective private policy for you, even if climate sensitivity ends up to be above the modal estimate. If you’re lucky, that is. Roger – your opinion based on hope, preference – or some actual peer-reviewed analysis of numbers that you would like to share with us? Link please. Here is a cost estimate for New York State to meet part of Governor Cuomo’s Executive Order reaffirming the state policy to reduce greenhouse gas emissions by forty percent by 2030, and eighty percent by 2050 from 1990 levels, across all emitting activities of the New York economy. The Manhattan Institute recently published “New York’s Clean Energy Programs, The High Cost of Symbolic Environmentalism” (https://www.manhattan-institute.org/html/new-yorks-clean-energy-programs-high-cost-symbolic-environmentalism-10565.html) by economist Jonathan Lesser that provides cost estimates for some of the programs referenced in the Executive Order. Given existing technology, the CES’s 80 by 50 mandate is unrealistic, unobtainable, and unaffordable. Attempting to meet the mandate could easily cost New York consumers and businesses more than $1 trillion by 2050. The CES mandate will require electrifying most of New York’s transportation, commercial, and industrial sectors. (In 2014, for example, fossil-fuel energy used for transportation was twice as large as all end-use electricity consumption combined.) Even with enormous gains in energy efficiency, the mandate would require installing at least 100,000 megawatts (MW) of offshore wind generation, or 150,000 MW of onshore wind generation, or 300,000 MW of solar photovoltaic (PV) capacity by 2050. By comparison, in 2015, about 11,300 MW of new solar PV capacity was installed in the entire U.S. Moreover, meeting the CES mandate likely would require installing at least 200,000 MW of battery storage to compensate for wind and solar’s inherent intermittency. Meeting the CES interim goals—building 2,400 MW of offshore wind capacity and 7,300 MW of solar PV capacity by 2030—could result in New Yorkers paying more than $18 billion in above-market costs for their electricity between now and then. By 2050, the above-market costs associated with meeting those interim goals could increase to $93 billion. It will also require building at least 1,000 miles of new high-voltage transmission facilities to move electricity from upstate wind and solar projects to downstate consumers. No state agency has estimated the environmental and economic costs of this new infrastructure. For what it is worth I think his estimates don’t include all the costs. Using your science for the ECS and the New York State Energy Research and Development Authority numbers referenced in the Manhattan Institute report referenced above what do you think the change in global warming temperature would be? For New York the reduction would be 76.2 MMtCO2e from 2014 levels for the 2030 goal and 170.6 MMtCO2e from 2014 for the 2050 goal. For costs use just the $18 billion in above market electricity costs. My question to you is the money spent on the mitigation reduction that you predict going to have tangible results? However I do that calculation I don’t see a measurable impact on temperature. If you have a different approach suitably referenced in the peer reviewed literature please show me. On the other hand spending that money on adapting New York would provide tangible benefits by making the state more resilient to extreme weather. Remember global warming is going to increase the probability of extreme weather and make it more severe. It is not going to prevent the extreme weather we have observed in the past and, in my opinion at least, we are not nearly as resilient to historical weather as we need to be. So my cost effective argument against mitigation is a lot of money spent for little effect might better be spent adapting to the past. He, like almost everyone else does not say but hey, I am happy to give up a LOT for the purpose of justice and equity…. Justice and Equity does it seem have some limits, even if AGW per se does not. That is what the AGW/CC scientists and mitigation proponents are up against, not matter how minor or insignificant the costs – and positive the outcomes – maybe for said mitigation and tough urgent action. The politicians in every nation sit far closer to people’s true values than most are willing to admit publicly. So here we are 30 years after Hansen’s shocking comments under oath to Congress. One source who says that adaptation is better than mitigation is James Lovelock. He says it’s too late to make effective change. He talks of bolstering sea defences in certain areas and building tower blocks in Ireland to house the climate refugees. See “The Revenge of Gaia”. #26: Has anyone had a chance to read and comment on the very recent article “The application of machine learning for evaluating anthropogenic versus natural climate change” by John Abbot and Jennifer Marohasy in GeoResJ at http://www.sciencedirect.com/science/article/pii/S2214242817300426#! His motives are clear, and reprhensible. IMO. I’m hoping someone will check my math, because all the drama you present makes me think I must be dividing wrong. Meeting the CES interim goals—building 2,400 MW of offshore wind capacity and 7,300 MW of solar PV capacity by 2030—could result in New Yorkers paying more than $18 billion in above-market costs for their electricity between now and then. That’s $69 more per year per capita, assuming that the original numbers are sound, and are calculated against future increases with business as usual. This is a big problem? Now, I may again be getting something wrong, but wouldn’t all that building be an economic plus for the State? Wouldn’t it boost employment? I mean, Texas is going to have an economic boom payed for by people in other states, rebuilding after the storm, through insurance and Federal welfare payments (“disaster relief”) and FEMA and so on. Why doesn’t it make sense for NY State to pay a little more for electricity, when all of it gets fed back into the local economy? This is the “cause and effect” problem I mentioned originally. Money spent on infrastructure and new equipment doesn’t just vanish into some other dimension– it isn’t “taken out of the economy”, it’s simply directed from one sector to the other. So, if you electrify and go solar, Elon Musk wins and the Koch brothers and Exxon lose. And, unlike rebuilding after a hurricane, you end up with a whole bunch of new and better technology. Anyone can claim to be an environmentalist, pragmatic or otherwise. We have only virtual Roger’s words with which to guess his intentions, but they’re enough to hold him responsible. To assert, baldly, that calling someone an AGW denier is equivalent to calling her a holocaust denier, is nothing more than a transparent rhetorical tactic. It demands to be called out as dishonest, not rebutted. Roger can try to make ‘deny’, ‘denial’ and ‘denier’ mean what he wants them to mean, but he is not their master. Roger, the random, disproportionate prices paid for AGW to date are sufficiently documented that claims they are negligible, or that they are not tragic for the victims, or that their tragedy should not be counted as a cost, or that the global cost won’t mount as long as the large-scale transfer of fossil carbon to the climatically-active pool continues, are simply extraordinary. It’s not our job to explain why your arguments aren’t extraordinary enough. Regardless, the benefits of your last purchase of “cheap” fossil fuels are yours alone, while the marginal climate-change cost you are emitting freely out your private tailpipe is right now being paid for in homes, livelihoods and lives by people who enjoy no benefit from your crosstown errands. What makes you think you shouldn’t pay the full price of your comfort and convenience instead? Thank you for the cost numbers but I am more worried about the value for $69 per person investment. If we pretend that amount of money would meet the 76.2 MMtCO2e from 2014 levels 2030 goal, then how much global warming will that investment prevent? In my opinion I would rather spend that $69 per person hardening infrastructure which would be an economic plus for the State, boost employment and reduce the costs of the next extreme weather event because when I calculate the effect on global warming it is too small to measure. I would also rather spend a share of that money on research for alternative low carbon energy sources because I don’t think current alternatives are fit for that purpose. Thomas (@30) seems to infer an “only” where one was not implied. The “little” was not intended to set an upper limit, but rather to minimize the resistance to taking on more of the burden than those in countries less responsible for pipeline warming and less able to change the future path of warming. I’m trying to understand your claim, but you are being way too vague. You seem to be calculating “effectiveness” on a global scale by looking at the effect of a single State’s policies. That makes no sense at all; it is the aggregate of policies at State and national levels globally that matters. It has always been the case that advances in technology spread from wherever the economy can first support them– see, for example, cellphones. So, the East Coast of the US can install offshore wind thanks to the development of the tech in Europe’s installations, and by doing so, further reduce costs and increase effectiveness through economy of scale. Likewise with other advances. So, I would suggest you try to incorporate the knock-on effects in your calculations. As to adaptation: For the electricity and transportation sector, surely a distributed production infrastructure (rooftop solar) with EV at least up to the delivery truck level is vastly superior to the existing system that can be knocked out by a blizzard for weeks. If your concern is coastal flooding– we are back to the burden question. Upstate NY probably would not take kindly to paying for a giant seawall for NYC. Nor the fine folk in interior flyover country, I suspect. If you have some sort of specific, concrete proposals for your adaptation policy, I would be happy to hear them. But the things I can think of seem to be a very hard sell compared to combined mitigation/adaptation technology as I described. I think the problem is that you are taking the world view and I am looking entirely at the parochial New York State view. Therefore, in my mind a more rational (maybe cost effective is not the right phrase) current New York energy policy would be to invest in resiliency to extreme weather and fund research for New York State research to provide low carbon technology of the future rather than spend any money on subsidizing current renewable energy. Maybe they can develop a distributed energy system using intermittent and diffuse solar and wind that will supply the needs of electric vehicles. I would like to apologize for my earlier comments. There should be no appreciable difference in the rate of warming between SST and MAT (according to climate models), excluding areas with sea ice. Roger, it sounds like you really haven’t given very much thought to this, beyond the “slogan” level. If you can’t tell us what “investing in resiliency” would be like concretely, so we can evaluate the physical and political feasibility, there’s nothing to discuss. Also, a distributed energy system using wind and solar is exactly what I just suggested, and it already has been demonstrated, so I have no clue what you mean by “research”. There are plenty of rooftop solar installations, and many individuals who have them also have EV, and my impression from their reporting is that it works fine. Likewise for cases where you can contract for wind-generated electricity to charge your battery. Maybe you need to dig a little deeper in your reading and learn something about the physical and economic aspects, and not just be guided by right-wing think tanks and blogs.